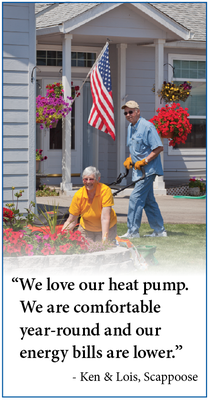 A heat pump keeps your energy bills low and your house comfortable, year-round. Our Air Source Heat Pump Program provides rebates and quality assurance to PUD customers who install qualified heat pump systems. All PUD residential customers may participate in this rebate program. The heat pump may be installed in an existing home, or as part of new construction. Heat pumps that are installed by participating contractors that meet Performance Tested Comfort Systems (PTCS) criteria will qualify for the rebate. PTCS is a series of diagnostic tests designed to ensure that your new heat pump system performs optimally. For homes with ducts in an unconditioned space, duct sealing is required for the rebate. High-efficiency heat pumps must have HSPF of 9.0 & SEER of 14.0 or higher. Standard heat pumps must have HSPF less than 9.0 & SEER less than 14.0. *An additional rebate of $200-$250 is available if duct sealing work is required. Request Proposals – Contact a participating PTCS certified contractor to arrange for a home consultation. To find a local contractor, search our list of PTCS contractors (PDF) or view a complete list of all PTCS contractors. Review Proposals – The contractor will visit your home and prepare a written proposal. A copy of the proposal will be given to you and another copy, which includes heat load calculations and other important information, will be sent to us for review. We will review the proposal and notify the contractor whether the system qualifies. Install the New System – The contractor will install your new heat pump according to PUD and manufacturer specifications, then forward installation documentation to us and PTCS for review. We will schedule an inspection of your new system and request copies of the installation documentation from you. View our Home Heating Guide. Use this chart to compare the cost of common heating systems producing the same amount of heat. It can help you decide which heating system is right for you.